Every time you attach a Windows 8.1 PC to a network and you tell Windows Yes, Turn On Sharing and Connect to Devices, Windows starts sniffing around the network to see whether any Windows 7 or 8 or 8.1 PCs are attached to the network and, if so, whether any of them belong to a HomeGroup. 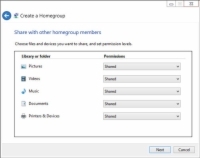 1Tap or click Create a HomeGroup in the dialog box. 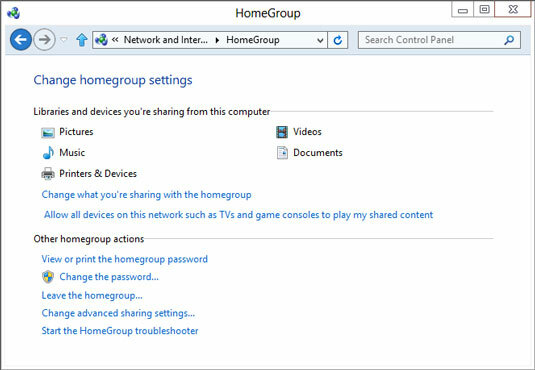 Windows tells you a little bit about HomeGroups and tells you that it’s protected with a password. 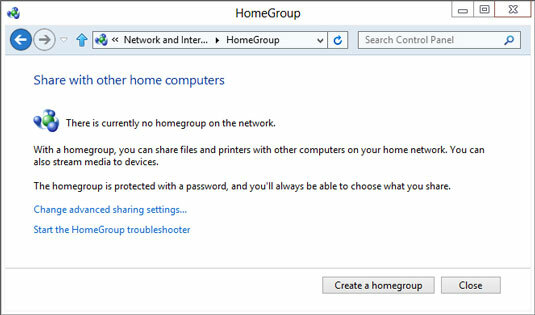 The Create a HomeGroup dialog box appears. 3Select which Libraries to offer to other PCs. 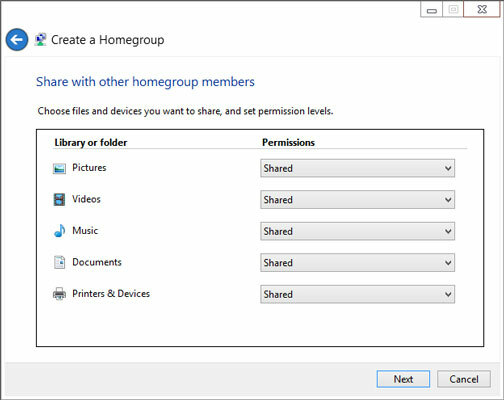 For most people, the big question about HomeGroups is whether you want to share your Documents Library with other PCs attached to the HomeGroup. By default, Windows doesn’t put your Documents Library out for sharing. You can, if you want. Windows sets up the HomeGroup and generates a random password. The password appears in the Use This Password dialog box. You can safely ignore it — no need to write down the password because you’re going to change it. The Change HomeGroup Settings dialog box appears. 6Tap or click the Change the Password link. Windows warns you that changing the HomeGroup password will disconnect everyone. Of course, there isn’t an everyone — you just set up the HomeGroup. Now you’re going to change the password from the monstrosity that Windows pulled out of thin air and turn it into a password that you can remember. 7Tap or click Change the Password (again). Windows offers you a box in which you can type your own password. 8Type a new password — one that you can remember — and tap or click Next. No need to be Sherlock Holmes about it. Remember this password applies only to people who are already connected to your home (or office) network. Windows treats you to another shhhhh-super-secret password box like the one in Step 4. You know the password now. And you can always retrieve it. So fuhgeddaboutit.